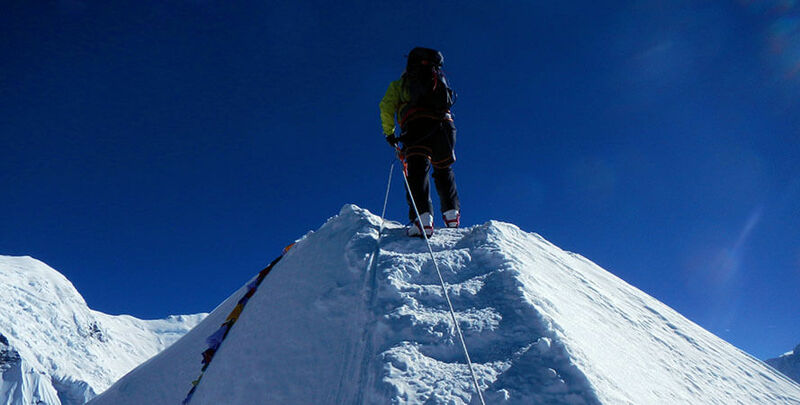 Island peak climbing is getting famous among the trekking peak climbers nowadays because of its stunning scenery as well as gives to adventure lovers another chance to explore the Everest Base camp . Island Peak is located in the Everest Region Khumbu area which offers an impressive and highly glaciated face that emerges from the Lhotse Glacier. Island peak at an elevation of 6189m is actually an extension of Lhotse Shar located between the Lhotse and Imja glaciers, so the Island peak is also called as Imja-tse in local lenguage. 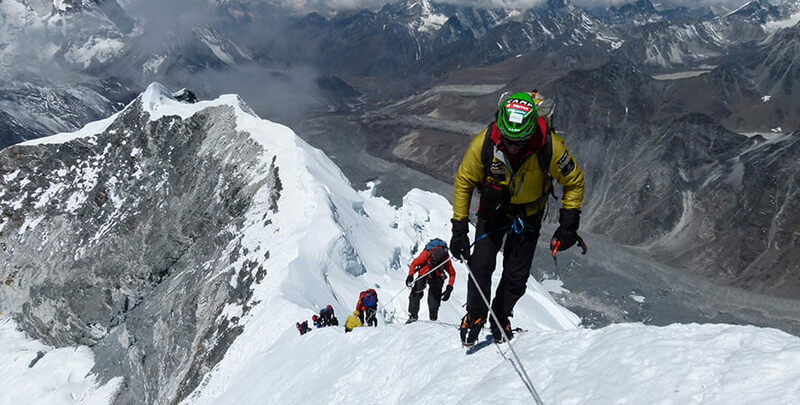 Island peak climbing also offers spectacular scenery of the Khumbu region and the Chhukung valley. From the highest point of the peak you can delight yourself with the huge south face of Lhotse and the wonderful view of Amadablam Peak. 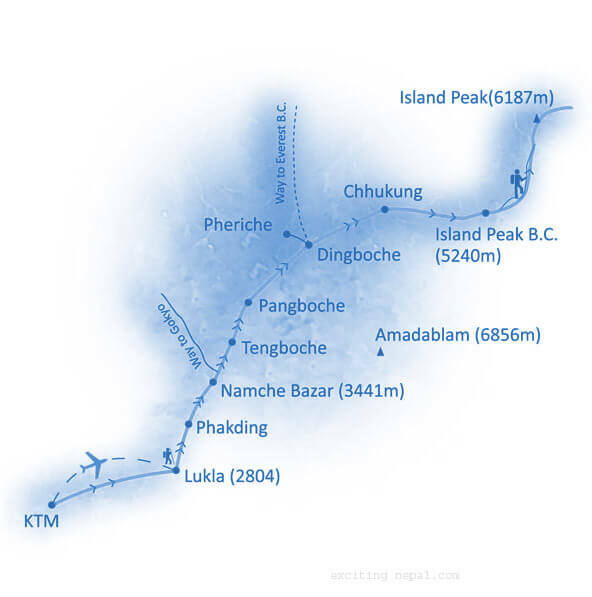 For Island peak climbing ,We begin our climbing expedition with a flight to Lukla from Kathmandu takes about 40 Minutes. We accompany the Dudh Koshi river valley and stay one day in the Sherpa town of Namche Bazzar and enjoy the local market. 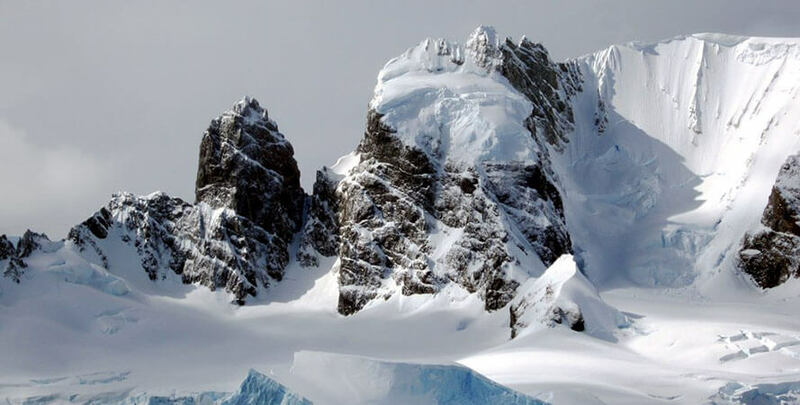 Next day our journey stop at Tyangobche which from here we can see the best view if the mount Everest. Tyangobche offers one of the finest scenery of Everest as well as many other peaks like Cho Oyu and many different mountains and ancient Tyangobche monastery. Exploring Namche Bazaar, Khumjung Village and Pangboche Village. Sherpa culture and customs. trekking through dense forest. Visit Napache park head quarter, Explore the Khumbu region. Elevation and altitude for profile island peak. Day 01: Arrival and transfer to the hotel in Kathmandu. Day 04:Phakding - Namche Bazaar. Walking through the magnificent forest of rhododendron, ending your nature-filled journey at Namche Bazaar which takes about 7 hrs from Phakding. On the way we can experience the scenery of blue pine forests, firs, and junipers. Enjoy the beautful village of Namche along with the friendliness and hospitality of its local Sherpa people. Visit the local museum which displays the area’s native flora and fauna as well as the history of the Mount Everest region. Begin their trek with awe-inspiring, unforgettable views of Mount Everest, Nuptse, Lhotse, Cholatse, Kantaiga, Ama Dablam and Thamserku. This trek is quite an easy walk from Namche to Phunki, followed by a three-hour ascent towards Tengboche. A short day’s journey towards Pheriche consists of a trek through forests filled with of a variety of lush trees - birch, conifers and rhododendron. This picturesque trail dips down to Devuche, crossing the Imja River before climbing up to Pheriche. 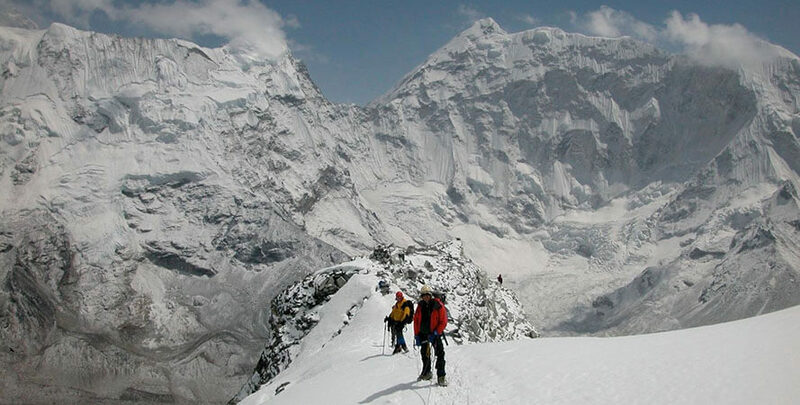 continue up the wide valley beneath the impressive peaks of Cholatse and Tawache on the left then turn right and climb more steeply towards the foot of the Khumbu Glacier., before zigzagging up through the boulders of the glacier's terminal moraine. 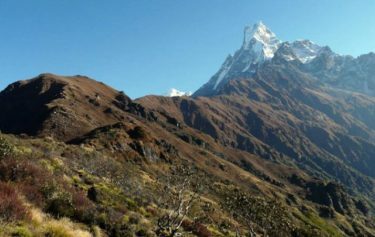 To reach our next objective, Kala Pattar, the trail follows the Khumbu Glacier, and offers superb views of the surrounding mountains, especially where the path is forced to rise to cross a tributary glacier. Later in the afternoon, when the sunset colors begin to appear on Everest, we make our way to the top of one of the finest viewpoints in the Everest region, Kala Pattar [5554m]. 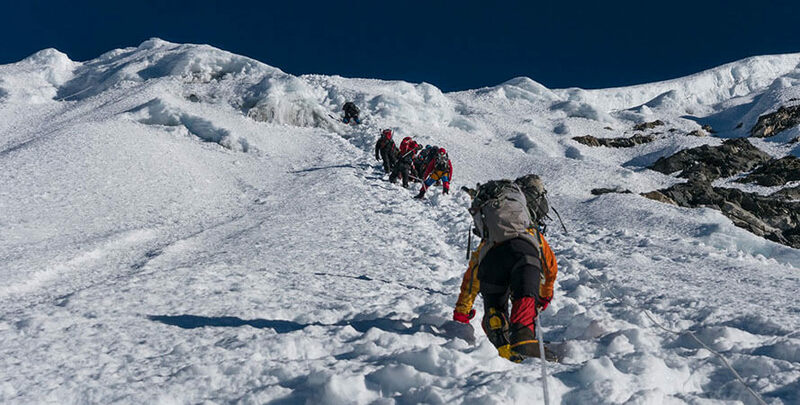 To reach Everest Base Camp, a very early start is required, as it takes several hours on a trail which weaves its way through ice pinnacles and past the crevasses of the Khumbu Glacier. 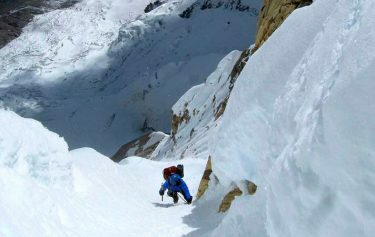 On the return leg, we can take a higher route to get a spectacular view of the Khumbu icefall and the route to the South Col. We return to Gorak Shep. We head back down today, through Duglha, to the summer village of Dingboche, where the houses are dotted about in the fields. An easy walk for about 2 hours, climbing up gradually to the small settlement of Chukhung. Along the way we have great views of Island Peak and the challenge that awaits us. Camp Another easy day, the trail crosses the river and follows the valley for approx 3 hours, passing beneath the magnificent south face of Lhotse. 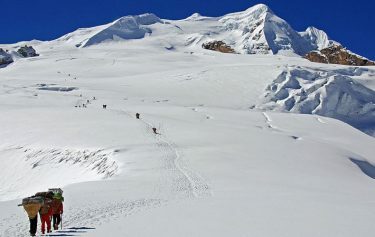 Base camp is by the side of the Imja glacier, below steep grassy slopes which mark the start of the climb on Island Peak. After descending along the trail to Chukhung, we continue on to Dingboche for lunch. It is then another couple of hours to the lovely village of Pangboche. follow the river and, after crossing it, climb back up through birch and rhododendron forest to Tengboche. Kwangde, Tawache, Everest, Nuptse, Lhotse, Ama Dablam, Kantega and Thamserku are just a few of the Himalayan giants to be seen. From Tengboche we descend to the bridge over the Dudh Kosi at Phunki Tenga, where there are water driven prayer wheels, before making our way back to Namche. Final day's trekking follows the Dudh Kosi back down to Lukla. This last evening in the mountains is the ideal opportunity for a farewell party with the Sherpa guides and porters, where we can sample some chang, try Sherpa dancing and look back on a memorable trekking experience. After breakfast, transfer to airport, fly to Kathmandu takes half an hour. All Your Arrival and departure from Airport - Hotel - Airport. 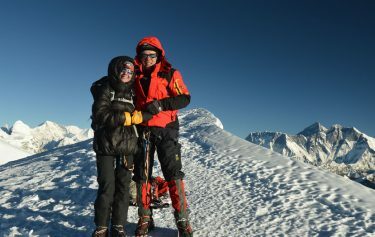 Climbing peak permit and one climbing guide (Sherpa). A trekking guide during the trek. All Meals ( Breakfast / Lunch / Diner ) during the trek and camping and a cup tea coffee during the breakfast. Personal accident insurance, emergency evacuation cost, oxygen. Island peak is located in Everest region of Nepal which is right on the Nepalese, Tibetan border. 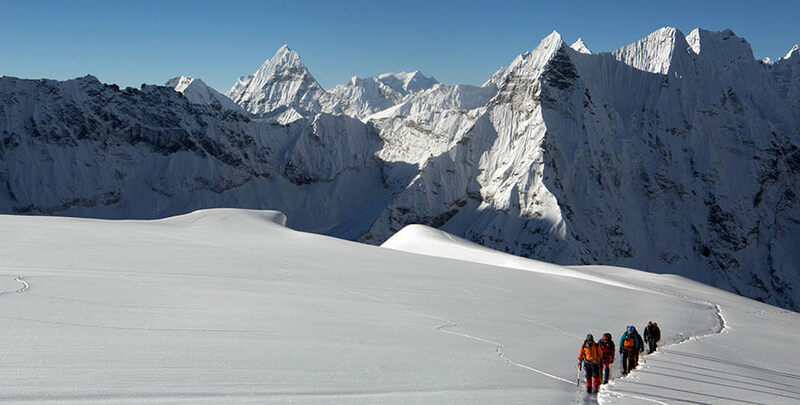 Island peak is an extension of Lhotse and Everest. 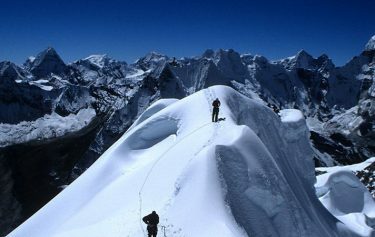 The ridge line drops of Lhotse and right onto the summit of Island peak. The Imja valley is home to amazing glaciers running down from 8,000m high in the unique mountain valley. 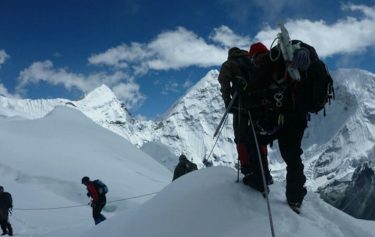 Our Itinerary of Island peak is also including Everest Base camp Trek.